When you need a scorecard to understand what is going on in a film, it's a fair bet that the film in question isn't all that good. Think of David Lynch's "Dune." "Highlander: Endgame," needless to say, is not a good film, even though it does star two likable actors -- Adrian Paul as Duncan MacLeod, a 400-year-old immortal from the Scottish Highlands, and Christopher Lambert as his even older kinsman and mentor, Connor MacLeod. 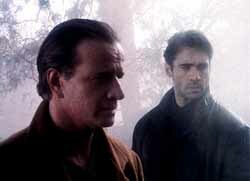 Christopher Lambert, left, and Adrian Paul look only half as confused as you will after this movie. Like all immortals, the two are part of The Game, a centuries-old contest in which all immortals face each other in single combat. The only way an immortal can die is to lose his head, literally. And when one immortal decapitates another, he takes the fallen immortal's power in a process called the Quickening. The object of The Game is simple: The last immortal standing wins The Prize, although what The Prize is remains something of a mystery. Whatever it is, it's something important enough that the world's good immortals don't want to see it won by one of the evil ones. Unfortunately, one of the bad guys is so determined to win The Prize he'll break the rules of The Game -- one-on-one combat only and no fighting on holy ground -- to get it. The bad guy in question is Kell (Bruce Payne), who, in addition to being after The Prize, has a personal score to settle with Connor. Kell has formed a small army of immortals, and together they are roaming the Earth, slaughtering other immortals en masse. It's up to Connor and Duncan to join forces against Kell, but there is one small problem. While Kell may not be above breaking the rules, Connor and Duncan are. They can't fight him together. And Kell, meanwhile, has had so many Quickenings that he is too powerful for any one immortal to face alone. Then there is the added complication that one of Kell's henchmen, Faith (Lisa Barbuscia), is one of Duncan's former lovers, and, of course, she holds a grudge, too. "Highlander: Endgame" marks only the second time the two immortal Scotsmen, Connor and Duncan, have teamed up. The first time was in the premier episode of "Highlander: The Series," the television version of the "Highlander" saga, which chronicles Duncan's adventures. The TV series ran from 1992 to 1997, and it actually became quite good once it evolved beyond its initial Duncan-chops-off-the-villain-of-the-week's-head formula. "Highlander: Endgame" picks up where the TV series left off. Connor, on the other hand, first appears in the 1986 movie, "Highlander," which also features Sean Connery as Connor's mentor, Juan Ramirez. By the end of "Highlander," Connor has claimed The Prize by defeating an evil immortal named Kurgan (Clancy Brown). That should have been the end of the story, but when the low-budget film became a sleeper hit, two inevitable sequels followed: "Highlander 2: The Quickening" and "Highlander: The Final Dimension," the latter of which totally ignores the former. In these poorly conceived sequels, new immortals from other planets and other times pop up to challenge Connor. The whole thing is quite a mess, and most fans of the first film like to pretend the sequels don't exist. As Ramirez told Connor of the immortals, in the end there can be only one. Who knew then that would come to apply to "Highlander" films as well? "Highlander: Endgame" also pretends the sequels don't exist. In fact, both "Highlander: Endgame" and "Highlander: The Series" assume that half of the first "Highlander" didn't happen, either. For the purposes of "Highlander: Endgame," the present-day sequences of "Highlander," in which Connor fights Kurgan and wins the Prize, never took place. All of the parts of "Highlander" that took place hundreds of years ago, however, did. Of course, once you get the screwy, non-continuity of the "Highlander" saga down, there is still the problem that "Highlander: Endgame," even taken on its own, is hard to follow. The film is only about 80 minutes long, and the story, such as it is, suffers for it. If you haven't seen the TV series, you'll be scratching your head, wondering who some of the supporting characters are. Also, the film jumps forward and backward in time, catching Duncan and Connor at various points in the long lives, in an almost haphazard way. If ever there was a movie for dedicated fans only, "Highlander: Endgame" is it. And the only reason "Highlander" fans should see it is to have further proof that there can be only one.